The July 15 Martyrs' Bridge was closed during the night of the coup bid by soldiers around 10.00 p.m. local time (1900GMT). 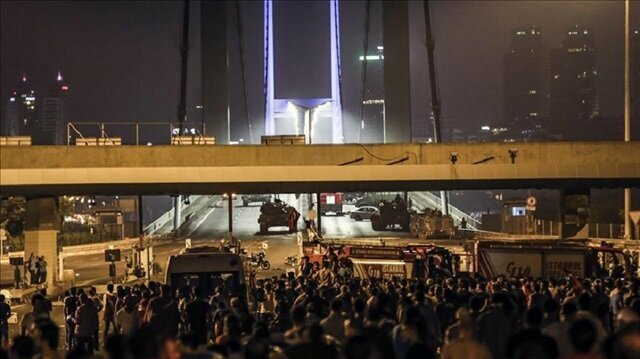 A Turkish court sentenced 84 defendants to life in prison on Thursday for their roles in clashes on the July 15 Martyrs’ Bridge in Istanbul in which 34 people were martyred during an attempted coup two years ago. A total of 133 suspects remanded in custody were at Thursday’s hearing at Istanbul’s 25th Criminal Court, according to judicial sources who spoke on condition of anonymity due to restrictions on talking to the media. During the hearing, 72 out of the suspects got aggravated life sentences for trying to overthrow the constitutional order, while 12 others got the same sentence for the murder of Erol Olçok and his son. The remaining suspects were sentenced to jail terms of 15-17 years. American experts on Wednesday warned of the threat posed by the Fetullah Terrorist Organization (FETÖ) in the country. "I believe that the Gülen movement in the U.S. presents a unique and unusual security threat," said Mark Hall, producer, screenwriter and director of the documentary "Killing Ed", which probed the financial practices of FETO-linked charter schools in the U.S.Security measures stand out at FETÖ’s Pennsylvania campSpeaking at the panel "July 15 Coup attempt: Two Years Later" organized by the Global Policy Institute in Washington, D.C., Hall said FETÖ threatens the U.S. mainly by bringing in unqualified employees from other countries, especially from Turkey, as well as through money laundering and forgery of documents, deceiving local and federal authorities.He noted that the terror group has also been financing major public relations firms for ages to convince American society that they are compatible with democratic, moderate American values. But a closer investigation reveals exactly the opposite. "The Gülen movement has financed over a 19-year period a huge PR movement to provide a story about who they are. But when you look more closely, it is not a group that is democratic or that has the U.S.’ best interests in mind," Hall said.FETÖ terror ringleader sends instructions to group membersAt least 16 FETÖ suspects arrested across TurkeyEmphasizing that FETÖ's U.S.-based leader Fetullah Gülen needs to be extradited to Turkey, he added that the U.S. government should also pay attention to the immigration issues related to FETÖ-linked charter schools. "The schools should be removed from receiving tax dollars," he said. FETÖ and Gülen orchestrated the defeated coup of July 15, 2016 which left 250 people martyred and nearly 2,200 injured.Ankara also accuses FETÖ of being behind a long-running campaign to overthrow the state through the infiltration of Turkish institutions, particularly the military, police and judiciary.Hall, in a previous panel, said he heard about the July 15 defeated coup from TV news while he was in the process of filming a documentary, and "it was no surprise" to him to learn that FETÖ was behind the coup attempt.Another speaker at the panel, Abraham Wagner, who is a lecturer in national security law at Columbia Law School, said the corruption in taxes and immigration that FETÖ commits in the U.S. needs to be examined thoroughly.He also said that FETÖ is not known in America in detail. "There is not a great deal of awareness in America among the public or the media about what the Gülen movement is," Wagner said. "It is unfortunate that it hasn’t gotten the media coverage or official law enforcement coverage that it needs. "Mary Addi, who formerly taught at a Gülen movement school in the U.S., also spoke at the panel.Addi said she first learned that her Turkish husband, who also taught at the school, was part of the movement when she realized he was giving 40 percent of his salary back to the movement. "I said to my husband, 'Do you get that this is not legal? They are extorting money from you,'” she said, describing it as "illegal and money laundering".Stating that FETÖ attempted to force her husband to divorce her because she was investigating its corruption, Addi said she worked with her husband to gather evidence of wrongdoing at the schools and submitted it to the relevant authorities.However, she said she has been told that the biggest problem the agencies investigating the movement are facing is tracking the money. Addi also said she has been giving interviews to foreign media outlets while American media outlets turn a blind eye to the issue.“Where are our government officials? Why is our own country not doing anything about these schools? "There is not a doubt in my mind as to whether they are insidious, dangerous and terrorists." The night of the coup bid by the Fetullah Terrorist Organization (FETÖ), 34 people were martyred on the July 15 Martyrs' Bridge (then called the Bosphorus Bridge) including prominent advertiser Erol Olçok and his son Abdullah Tayyip Olçok. All but two of the martyrs were civilians; the remaining two were police officers. FETÖ, led by U.S.-based Fetullah Gülen, orchestrated the defeated coup, which left at least 250 people martyred and around 2,200 others wounded. The government also says FETÖ is behind a long-running campaign to overthrow the state through the infiltration of Turkish institutions, particularly the military, police, and judiciary. Pennsylvania locals living near the complex of U.S.-based leader of FETÖ, the group behind the 2016 defeated coup in Turkey, have spoken of their unease at the terror group’s obscure activities and secluded living in America.Fetullah Gulen, leader of the Fetullah Terrorist Organization (FETO) and a fugitive from Turkish justice, has lived in the U.S. for decades.Since 1999, Gulen resides in a secluded mansion complex named the “Golden Generation camp” at Pennslyvania’s Saylorsburg village.Speaking to Anadolu Agency, David Bonser, a 72-year-old owner of the local Kostonbador farm, said local authorities are applying “double-standards”, and added that: “Without a permit, they do whatever they want.”Bonser also said he attempted to take a look at the complex and said he noticed that armed men were protecting the property. “There is something going on in there but I don’t know it,” he added.About Gulen’s terror links and his attempt to overthrow the legitimate government in Turkey, Bonser said: “I’m very concerned about having a possible neighbor which is quarter a mile away and possibly be a world terrorist leader. I can’t prove it but it’s been in the news all the time.”John Favere, a resident of nearby Wind Gap, also expressed concerns over FETO and its defeated coup of 2016. “My concern is what happened in Turkey, when the coup took place. What is his objective in this country? "How long will it take or if it ever takes place, will he do the same thing to the United States as he did to his country Turkey.“FETO is taking control over the town through properties on a very frequent basis. And here’s the main point: What is he [referring to Gulen] doing to America and its politicians, how does he pay them? Where is this money coming from to control our government?”Four FETÖ members jailed in defunct daily caseTurkey, US agree on clearing Syrian regions of PKKTurkey issues arrest warrants for 346 FETÖ suspectsFavere said other residents in the town are also concerned about Gulen and his group FETÖ.In July 2016, FETÖ and Gulen orchestrated a defeated coup in Turkey which left 251 people martyred and nearly 2,200 injured.Since the coup bid, Turkey has sought Gulen's extradition from the U.S., and complained that the U.S. is not moving fast enough on its request.Ankara also accuses FETÖ of being behind a long-running campaign to overthrow the state through the infiltration of Turkish institutions, particularly the military, police and judiciary.FETÖ also has a considerable presence outside Turkey, including private educational institutions that serve as a revenue stream for the terrorist group, including in the U.S.
An Istanbul court on Friday sentenced four former columnists from shuttered daily Zaman linked to Fetullah Terrorist Organization (FETÖ) -- the group behind the 2016 defeated coup, a judicial official said.The 13th Heavy Penal Court in Istanbul gave jail terms of eight years and nine months each to Ali Bulac and Sahin Alpay for being a member of an armed terrorist group, said the official, who asked not to be named due to restrictions on speaking to the media.The other two columnists, Mumtazer Turkone and Mustafa Unal, were given 10 years and six months in jail for the same charge.Turkey issues arrest warrants for 346 FETÖ suspectsThe court also ruled the release of Ahmet Turan Alkan, who had been in jail pending trial.FETÖ and its U.S.-based leader Fetullah Gulen orchestrated the defeated coup of July 2016 in Turkey which left 251 people martyred and nearly 2,200 injured.Ankara also accuses FETÖ of being behind a long-running campaign to overthrow the state through the infiltration of Turkish institutions, particularly the military, police, and judiciary. This June top members of FETÖ, the terrorist group behind the 2016 defeated coup in Turkey, held meetings in 18 different countries to share instructions from the terror group’s leader, according to security sources.Members of the Fetullah Terrorist Organization (FETÖ) gathered in clandestine meetings to convey instructions from Fetullah Gulen, the terror group’s U.S.-based leader, in the last week of June, said the sources, who asked not to be named due to restrictions on speaking to the media.The sources also said 33 members attended a meeting in Pennsylvania, the U.S. state where Gulen has lived since 1999.At least 16 FETÖ suspects arrested across TurkeyDuring the meetings, instructions from Gulen were read out to the attendees, they said.- Terror leader instructionsBelow are some of the instructions uncovered by intelligence sources:- "Get married to someone from the country you’re living in to gain acceptance.- “Deter investors in the country you’re living in from investing in Turkey and stop any investments in Turkey by our members.- “Try to find new people to join us and relieve our students according to the position of the country they are living in.- “Brothers and sisters should pay maximum attention. They should steer clear of state institutions.- “Provide those brothers making international journeys with all kind of support.”The list of instructions also called on FETO members to take more care and take organized action as they feared pressure on FETO would intensify following Turkey’s June 24 presidential and parliamentary elections.FETO and its U.S.-based leader Fetullah Gulen orchestrated the defeated coup of July 2016 in Turkey which left 251 people martyred and nearly 2,200 injured.Ankara also accuses FETO of being behind a long-running campaign to overthrow the state through the infiltration of Turkish institutions, particularly the military, police and judiciary.